Under-age drinkers who try to get into nightclubs will be literally "under the thumb" - thanks to new technology being tested on Tyneside. Biometric fingerprint sensors are being trialled at a Newcastle nightclub in an effort to sift out under-18 revellers. The equipment has been designed by a Gateshead company, whose hi-tech gadgets have already featured in the Hollywood blockbuster I Robot. Police and leisure bosses are backing the revolutionary project. 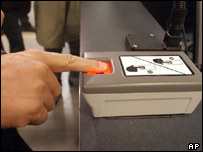 Biometric technology is already being used to combat terrorism at airports. But Gateshead-based UK Biometrics claims it could become a major tool in combating under-age drinking and associated anti-social behaviour. Northumbria Police and pubs and club chain Ultimate Leisure are supporting a pilot scheme, which has seen fingerprint sensors installed at Newcastle Blu-Bambu nightclub. UK Biometrics managing director Matt James said: "We can now get rid of people having to bring along identification to prove their age and identity if they want to get into a nightclub, or any other premises. "People just have to register with the system once by proving who they are, and that's that. "It is something that is there to protect the licence as well as people who go out on the town." The company says it has patented the idea and hopes it will be taken up by the leisure industry. Bob Senior, chief executive of Ultimate Leisure said: "We find that counterfeit IDs are so good now that it makes it very difficult to spot the difference with the real thing. "The great thing about the biometric system is it means that we as licensees can protect ourselves from the risks of accidentally allowing under-age drinkers in." Mr James added: "Fingerprint sensors are nothing new, but we are looking at how this technology can be incorporated into today's world." Mr James said the technology was also being tipped to be used at ATM machines and schools. The system is due to be exhibited at a security industry exhibition at Birmingham's NEC in May.